Founder, coach and player Curly Lambeau is the only Packer cred with wearing jersey No. 1, although it has never been formally retired. 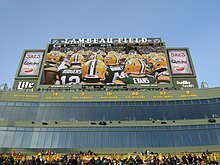 The Packers have recognized Lambeau in a more significant manner than just a number retirement by naming their current stadium Lambeau Field shortly after he died.